Lismore Cottage in North Ballachulish, near Glencoe, Highlands sleeps 4 people. Lismore Cottage near Glencoe has views from the upstairs living room across Loch Linnhe to the mountains beyond; this detached holiday house is a perfect base for those wishing to explore the area and all it has to offer! There are plenty of leisurely walks, forest paths and cycle tracks nearby and with the benefit of two drying rooms with drying facilities for clothing and equipment, Lismore Cottage is perfect for enjoying outdoor pursuits whatever the time of year. The local hotel/bar is within walking distance and slightly further afield there are many other good places to dine at. The area is renowned for its outdoor pursuits, spectacular scenery and an abundance of wildlife. Both Glencoe Mountain Resort and Nevis Mountain Range are only a short drive away, offering snow sports in the winter and fabulous views in the summer. Fort William, known as the Outdoor Capital of the UK is the nearest town and from here you can catch the West Highland Steam Train (as depicted in the Harry Potter movie) to Mallaig, crossing the famous Glenfinnan Viaduct. Nearby activities include mountain biking, climbing, kayaking, walking, golf and fishing. There are many unspoilt beaches, ruined castles, historic monuments, museums, and whisky distilleries to visit. 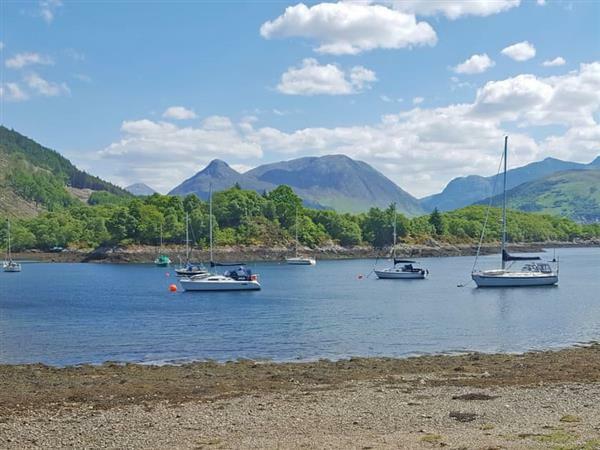 Head south to Oban’s bustling harbour for short ferry crossings to the inner isles including Lismore, Mull, Iona and Staffa, or cross on the Corran Ferry for a day exploring the Ardnamurchan Peninsula. The beautiful island of Skye, Loch Ness and the Highland capital Inverness are also easily reached. The shop and restaurant are 4 miles from Lismore Cottage near Glencoe, with the pub ¾ mile from Lismore Cottage. Kitchen/dining room: With electric oven, electric hob, fridge and 32 Smart TV. Utility room: With washing machine and storage for boots and coats. Oil central heating, electricity, bed linen, towels and Wi-Fi included. Travel cot and highchair available on request. Lawned garden with sitting-out area and garden furniture. Private parking for 2 cars. No smoking. Holidays at Lismore Cottage run from Friday to Friday. For a better idea of where Lismore Cottage is, you can see Lismore Cottage on the map below. Do you want to holiday near Lismore Cottage (UK11194), you can see other cottages within 25 miles of Lismore Cottage; have a look to find your perfect holiday location.